At the time I started the KB Body Series Challenge Dasha posted on instagram I had been already been working out regularly for months but was unable to lose weight. While I was skeptical that this program would work any more than the two programs I did prior to this one, I decided to give it a try. I ended up loving the mixture of kettlebell and martial arts moves in the DVD workouts and that the moves included could be made harder or easier. The eating plan was actually harder for me to follow than the workout, but it worked. I started by just following the calorie intact and then working on making changes in what I was eating. 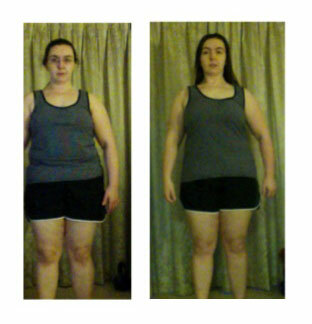 I noticed differences in my jean size a couple weeks into the challenge, and the weight came off along with it. By the end of the challenge I had lost just over 8 pounds, the 20 and still going strong. I still have a ways to go, but it helped me make a start to reaching my goal size and continuing on.